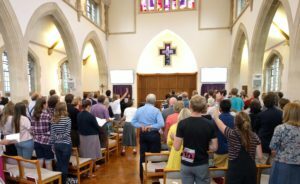 We are a vibrant Evangelical Anglican church in Bath, where you’ll find people of all ages, nationalities and backgrounds, committed to learning from the Bible, as we seek to love and serve Jesus Christ. We’re part of the Diocese of Bath and Wells and the Church of England, and our membership is currently around 300 adults and 100 children. Our main building is St Bart’s Church, but our ‘Riverside’ congregation meets in Hayesfield School, Brougham Hayes, BA2 3QX. 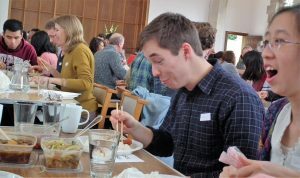 Every year a good number of people join our church as they move to Bath for study or work. We love to welcome newcomers whether you are investigating the claims of Christ or whether you are already a follower of Jesus. If you’re visiting us for the first time it’s probably best to start with one of our Sunday services. These are informal in style, encouraging joyful worship and practical Bible teaching. Do also have a look at our ‘Notice Sheet’ to get a feel of what’s going on. A whole range of children, youth and adult groups run regularly during the week, both in the church building and in homes. We’ve found these are the best way to build friendships with other people in the church family.